Apple has sold more than 220 million iPods since the 2001 launch. A US appeals court has ruled in favour of Apple in a lawsuit claiming that the iPod could be responsible for hearing loss. The judge upheld a 2008 ruling, saying "the plaintiffs simply do not plead facts showing that hearing loss from iPod use is actual or imminent". He also noted that Apple issues a warning with each of the music players. The two claimants said the iPod was defective because users can listen to it at the unsafe level of 115 decibels. Apple has sold more than 220 million iPods since its launch in 2001. 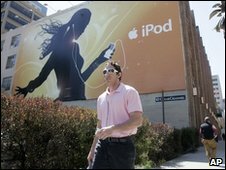 "The plaintiffs do not allege the iPods failed to do anything they were designed to do nor do they allege that they, or any others, have suffered or are substantially certain to suffer inevitable hearing loss or other injury from iPod use," Senior Judge David Thompson wrote in a statement. He added: "At most, the plaintiffs plead a potential risk of hearing loss not to themselves, but to other unidentified iPod users."